Home BOLLYWOOD Photos: Katrina Kaif’s Bodyguard’s Funny Act Makes Her Laugh Out Loud! Photos: Katrina Kaif’s Bodyguard’s Funny Act Makes Her Laugh Out Loud! [tps_footer]Bollywood stars Katrina Kaif and Aditya Roy Kapur are continuously promoting their upcoming film Fitoor. With back-to-back promotions, the stars visited Ahmedabad yesterday on February 9. 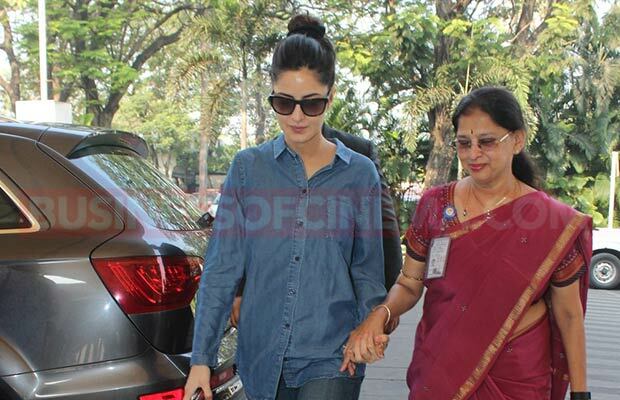 Wearing denim on denim, Katrina Kaif was in all smiles as she was making her way at the Mumbai airport with co-star Aditya Roy Kapur. While Katrina was sporting cool look, Aditya was nowhere behind to grab the attention in his cool attire. The duo grabbed all the attention as they arrived at the airport. With just few days left for the release of the film, the stars were quite on the go. They even returned back the same day after promoting their film in Ahmedabad. What caught our eyes was on Katrina Kaif ‘s bodyguard, who posed for the shutterbugs. Katrina’s bodyguard was clicked holding the actress’ photo, which was given to her by a fan. While the bodyguard posed for the shutterbugs, the entire Fitoor team broke into laughter. Not Katrina, but this time her bodyguard grabbed the limelight. Previous article5 Reasons To Watch Alleged Lovers Pulkit Samrat-Yami Gautam’s Sanam Re!